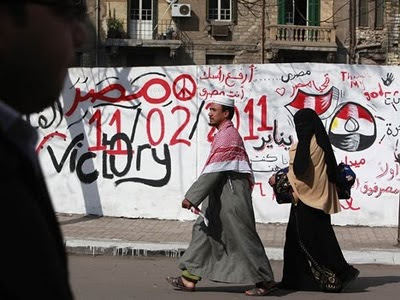 Middle East Perspectives by Rick Francona: Egyptian military embracing the Muslim Brotherhood? Egyptian military embracing the Muslim Brotherhood? "Raise your head - you are Egyptian" -- "Tahrir Square - January 25"
"First Egypt - over ...(blocked)" --- "Enough"
The initial decisions of Egypt's Supreme Council of the Armed Forces upon taking over the Egyptian government included a commitment to make changes to the country's constitution. The council has imposed a 10-day deadline on that process. That is ambitious to say the least, but if it can be done, it is a good thing. The sooner the military relinquishes control of the country to an elected government, the better. It is important that the new Egyptian government be truly representative of the population and at the same time be protective of minority groups. The constitutional changes must reflect those goals. However, a look at the eight members who the military council has named to the panel that will recommend changes to the constitution is not comforting. The judge heading up the effort, Tariq al-Bishri, is an avowed critic of secular government, favors the introduction of Shari'a-based laws and openly supports the Muslim Brotherhood. Egyptian law over the past 40 years certainly reflects a basis in Islamic law, but strict Shari'a code has not been fully adopted. Al-Bishri's appointment was understandably criticized by Coptic Christians who feel they may not have a voice in a future Egyptian government. The Copts make up about 10 percent of Egypt's population and fully supported the uprising, yet as a group they are under-represented as the military transitions the country from the government of Husni Mubarak to one still only in the conceptual stage. The committee will not rewrite the entire constitution, but focus on six articles, including those that deal with the nomination of presidential candidates, the presidential election process, the election of members of the parliament and how to amend the constitution. That is a good thing. I do not want a panel with an Islamist Shari'a advocate and an avowed member of the Muslim Brotherhood addressing the legal code or individual freedoms. Yes, a member of the Muslim Brotherhood. The council named Subhi Salih, a lawyer who is a senior member of the Muslim Brotherhood. Coincidentally, the Islamist organization announced it will become a formal political party. In just a few short days, a formerly illegal organization is now a well-organized political party and has a representative on the panel that will rewrite significant portions of the Egyptian constitution. The Brotherhood released a statement calling for "the establishment of a democratic, civil state that draws on universal measures of freedom and justice, with central Islamic values serving all Egyptians regardless of color, creed, political trend or religion." We shall see. Despite the Brotherhood's protestations to the contrary, they want to eventually establish the Islamic Republic of Egypt. They are committed to the abrogation of the Camp David Accords of 1978 between Egypt and Israel, the agreement that has kept the two countries at peace for over three decades. The Brotherhood's persecution of and outright attacks on the Coptic Christians over the last few years indicates their lack of religious tolerance. Curiously, many Western analysts have attempted to draw parallels between the military situation in Egypt with that in Turkey. While there may be similarities with Islamist political parties gaining more power in both countries, the situation with the army in Turkey is different. In Tukey, the army is steadfastly secular. I do not assess the Egyptian army as that secular, nor is it diverse. If you look at the composition of the officer corps, there are few Christian officers and none in senior positions, and virtually no Copts serve in the military intelligence service. It is unknown how many Egyptian military officers are actually covert members of the Muslim Brotherhood. While the organization was technically illegal, it was openly tolerated in civilian society. Conversely, membership was not permitted openly in the military - sort of an Egyptian "don't ask, don't tell" system. It is surprising and alarming that Field Marshal Tantawi and his generals chose such a controversial group to rewrite portions of the constitution. One cannot help but be concerned about the seeming rapid rise and acceptance of Islamists into the senior levels of the groups that will define the type of country Egypt becomes. Special thanks to my colleague and friend Jacob Keryakes for his insights on this issue.